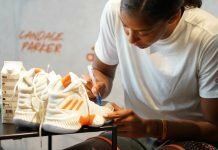 The Los Angeles Sparks had won only three games this season when Candace Parker returned to the team three weeks ago from a self-imposed hiatus. Since then they have notched five more wins, which included a streak of four in a row. The Sparks lost two consecutive games last week – the last one of which seemed to surprise the team itself – as it was to last-place Seattle. Sunday they cruised past the Chicago Sky, then second-ranked in the East. 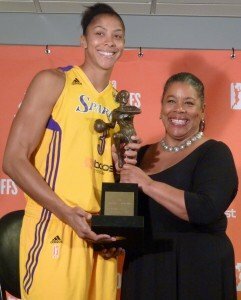 The Sparks have been called “rejuvenated” with the addition of two-time MVP Parker, as well as the return of veteran guard Alana Beard, who was injured. And to be sure, their record is improved. They are currently 8-16 and in sole possession of fourth place in the West, one game ahead of both the Storm and the Stars. Parker said she her teammates know they need to play with urgency. But Parker said the Sparks are working on staying motivated, and they’re learning how to fight through tough situations. If fans are quick to assume that the return of star players means the Sparks now will win almost every game, the athletes may be, too. Parker said expectations have to be realistic across the board. Maintaining momentum is hard for top teams, too. 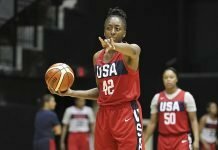 At the same time the Sparks and Sky were playing yesterday, the West-leading Minnesota Lynx lost to the hosting Washington Mystics – their third defeat in 12 days, which included a two-game losing streak. In post-game interviews, both Lynx coach Cheryl Reeve and All-Star forward Maya Moore cited the team’s lack of effort in the loss, and in general of late. “We just have to be harder to play against. Be more connected on the defensive end, and make sure that we do not let them get their momentum going in transition,” Moore said. Sparks coach Brian Agler said end-of-the-season road fatigue sometimes also plays a factor in a team’s energy level. “That’s why you see a variety of things happen this time of year because teams get on the road, they get tired, they might even be on the road and their first game back home is like a road trip because they just got off the road and they turn around and play right away,” Agler said. The Sparks get their next chance on their home court tomorrow against the surging Indiana Fever. The Lynx face the Mystics once again, Wednesday at home. Candace Parker accepts the 2013 WNBA MVP award from league president Laurel Richie. Photo by Sue Favor.